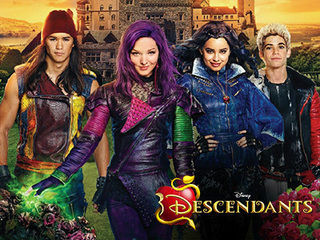 While I’m not in the target audience for most of the Disney Channel’s programming, I was drawn to the Descendants chiefly due to its concept: what if some of Disney’s top baddies had children and those children were given the choice to do good – would they take it or turn up their villainous noses? I first became aware of Descendants back in 2015 thanks to iTunes when it featured the first movie’s soundtrack on the store homepage. 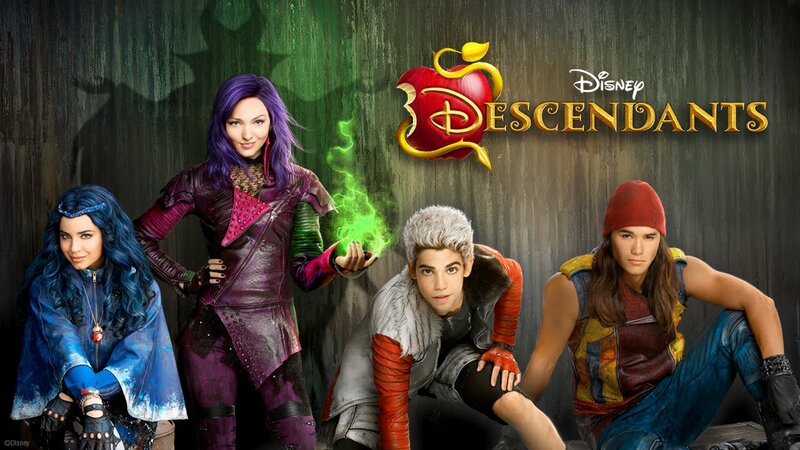 The idea of a story about the children of some of Disney’s worst neer-do-wells sounded intriguing and I listened to and liked some of the music; so I decided to check out Descendants in 2015 and its follow-up, Descendants 2, in 2017. But how do these two teen films stack up, and is there anything for an older audience to like? The first entry’s premise is fairly straightforward: characters from various Disney tales are split into two worlds with all of the good, noble, heroic figures residing in the United States of Auradon (yes, USA for short) and all of the villainous folk doomed to dwell on the Isle of the Lost where their ability to use magic is forever hindered. For years, these two groups have lived separate lives and, thanks to a magical barrier, are unable to cross to the other side. All of that changes when Prince Ben (Mitchell Hope), son of King Beast and Queen Belle, decides to allow some of the villains’ children to attend Auradon Prep and be taught how to be good. His handpicked villains-to-be are Carlos (Cameron Boyce), the cynophobic son of Cruella De Vil; Evie (Sofia Carson), the beauty and fashion-obsessed daughter of Snow White‘s Evil Queen; Jay (Booboo Stewart), the thieving son of Aladdin‘s magical malefactor, Jafar; and Mal (Dove Cameron), daughter of Maleficent, the most evil fairy on the Isle and its self-proclaimed leader. Conflict ensues as Mal, Evie, Carlos, and Jay aren’t exactly keen on the idea of learning to be good, but they will take any chance they can get to leave the Isle. However, Maleficent (Kristen Chenoweth) commissions Mal with finding Fairy Godmother’s wand and bringing it back to the Isle so she can become its feared ruler once more, only with magic in hand. At first, Mal is more than happy to make her mother proud, so she enters Auradon Prep with ulterior motives. However, over time, she, Evie, Carlos, and Jay find their place among their peers and begin to question whether a life of villainy is really the best path or if being good is a better way to live. To start, the four leads look like they are having a great time in their respective roles, and I commend actors for that. If an actor or actress looks like he’s bored or she’s just reading lines for a paycheck, then I’m not going to be too invested in their performance. But to Cameron’s, Carson’s, Boyce’s, and Stewart’s credit, that’s not the case. Each one of them brings a healthy dose of youthful energy and charming quirks that make them stand out, and their characters are each given a chance to shine in unique ways: Mal has to deal with the pressure of being Maleficent’s daughter, Evie tries to make her mother proud by trying to land herself a prince, Carlos contends with his fear of dogs, and Jay does his best to prove he can put his street smarts to the test. It’s these little traits and inner conflicts that make the cast fun to watch both as individuals and as a whole. And while the lip syncing during the movie’s musical performances might not be the tightest, for me it’s the performances that count more so than trying to fake singing along to a musical track, so I’d still award an A+ to each of the young leads. Speaking of music, Descendants boasts an upbeat, frothy pop soundtrack that is fun to listen to even on its own. Granted, it’s tuned for the Radio Disney crowd but that doesn’t mean it’s a weak mix of songs. 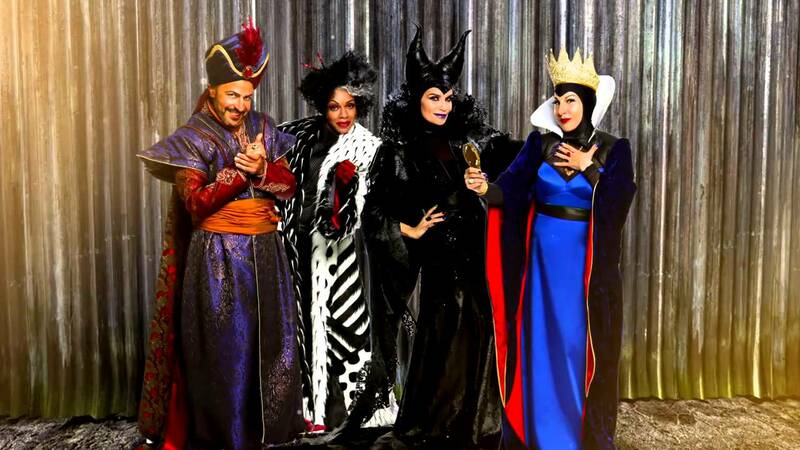 For me, the standout tracks would be the first ensemble number, “Rotten to the Core,” which injects dubstep into its poppy confection; “Evil Like Me,” a bouncy, boisterous, Broadway-esque track that allows Chenoweth to channel her inner Maleficent; and “If Only,” the movie’s only ballad that lets Dove Cameron fly solo, and it’s my favorite song of the bunch. Granted, there were two songs I thought were a bit cheesy: “Did I Mention” is a goofy puppy love song that accompanies an equally goofy dance number and the remix of “Be Our Guest” is appreciatively brief. However, I sense those tracks might appeal to a younger crowd and they are by no means awful. Lastly, the plot to Descendants is easy to follow but still entertaining thanks to the young leads and the plethora of Disney Easter eggs, some admittedly more cleverly included than others. The production value, too, is impressive as the sets are large, colorful, and do their best not to come across as low-budget or cheap. That being said, some of the special effects are a bit weak but, considering this was made for TV and not for cinemas, it’s forgivable. If I had any criticism, it would be that some of the plot hinges on a love story that becomes insta-love (though, to be fair, magic is involved to intentionally speed up the process). But even when magic is removed from the equation, the attraction between two characters is very much like what you’d see in a standard – but clean – YA love story. It’s not cringe-worthy, but, as an adult, it’s hard for me to hear teens proclaim how deep their love is for one another at the ripe old age of not-even-20. But to the movie’s credit, it’s sweet and chaste and the male love interest is a genuinely good guy, not a brooding bad boy or a low-down creep. Even though the plot is lightweight, it does present good messages about giving people a second chance and carving out your own path in life. Prince Ben is a noble character who believes that even a villain deserves to be treated with kindness and compassion. In the same way, Mal, Evie, Carlos, and Jay initially balk at the idea of changing their ways but eventually discover that they don’t have to follow in their parents’ footsteps – they can stand on their own, and while that doesn’t change where they came from, they can decide where their lives go in the future. 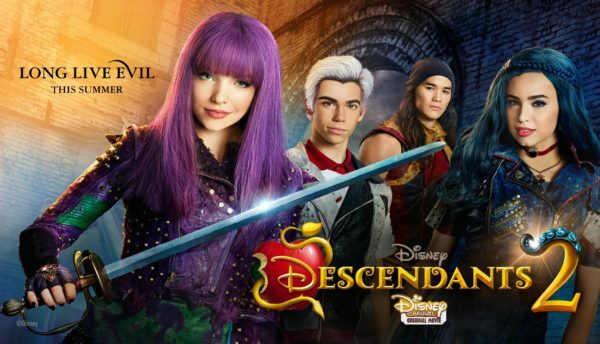 Overall, I’d give Descendants a solid letter grade of an A. It’s an enjoyable made-for-TV flick that, as a whole, is akin to summertime cotton candy: deep down it might be empty calories but it’s still colorful, delicious, sweet, and leaves you with a cheerful, sunny feeling inside. Unfortunately, I have to give its sequel, Descendants 2, a solid C grade. That’s not to say this is a bad followup, but much of what made Descendants work for me was lacking this time around. While Descendants had a definable plot, Descendants 2’s story is onion skin thin almost to the point of being non-existent. Rather than opening with a scene that sets the primary conflict, much like the opening scene in Descendants, this sequel kicks things off with, essentially, a music video for “Ways to Be Wicked” (a number clearly trying to recapture the feel and tone of “Rotten to the Core”). However, even though it’s a catchy song and it’s one of the soundtrack’s standouts, it doesn’t do anything to set the stage for the story. It’s as if the plot didn’t have a good way to work the song in, so it decided to tack on a music video at the start of the movie. This lack of initial focus plagues the plot as, for about the first hour, it seems as if the central conflict will be that Mal feels she doesn’t belong among the good people of Auradon and decides to return to the Isle of the Lost. Mal actually spends a lot of time bemoaning her “I-just-don’t-fit-in” state. While she manages to not become too annoying, her angst was something relatively unseen in the first movie, so it brings a bit of a damper on things here. 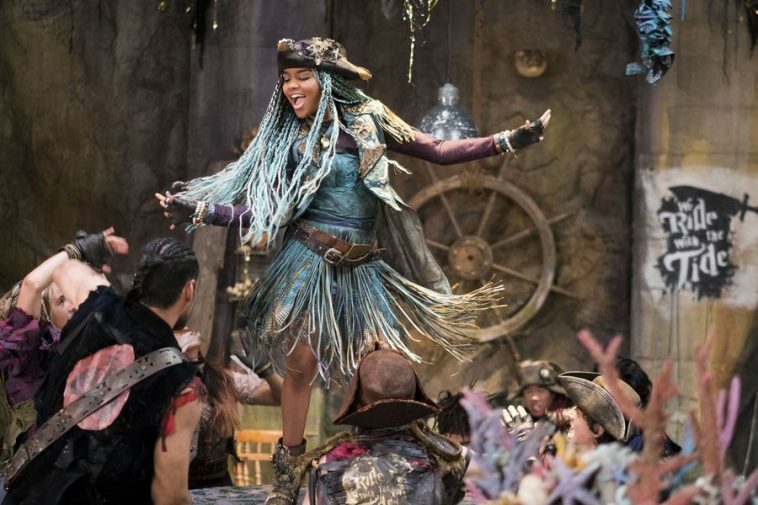 For about an hour, it seems as if the antagonist is going to be Mal herself and her existential crisis of sorts, despite the fact that, this time around, we’re promised some new faces in the form of three new villains’ children: Uma (China Anne McClain), daughter of Ursula; Harry Hook (Thomas Doherty), son of Captain Hook; and Gil (Dylan Playfair), the slightly meat-headed offspring of Gaston. These new faces don’t show up until the first hour is nearly spent, which is a shame as these new characters are fun albeit they are a bit one note. Likewise, as Uma is played up as Mal’s arch nemesis in the trailers, nothing early on in the movie itself really explains why the two girls are rivals other than they just are. (In fact, Uma’s backstory in Rise of the Isle of the Lost is more helpful to this effect.) Thus, once Uma tries to make a play for becoming boss of the Isle of the Lost, it doesn’t feel like a takeover but a convenient plot device because there was nothing else for Uma to do. If her story would have been introduced sooner and with more background, I think I would have found her character more enjoyable and relevant to the story as a whole. One aspect that helped ground the characters in Descendants but is decidedly absent here is the presence of the villainous parents. Even though their roles were minor in the first movie, we were still treated to scenes involving Maleficent, Cruella de Vil, Jafar, and the Evil Queen. These interactions provided background details for Mal, Evie, Carlos, and Jay as it helped audiences see who their parents were and how their parents treated them, which made the young leads’ transformations all the more striking. Plus, it added for some great comedy as these notorious Disney neer-do-wells haven’t exactly gone to seed, but they’re not at the top of their game anymore and it’s funny to watch them contend with that. However, in Descendants 2 we never see any of the young leads’ parents save for Maleficent in lizard form (so Ms. Chenoweth makes nary an appearance). We don’t even get introduced to the three new young villains’ parents, so Captain Hook, Gaston, and Ursula never show up except for a CGI tentacle and an off-screen voice actress as a fill-in for Ursula. Instead, it’s the youngsters ruling the roost here, and while it probably wasn’t necessary to show Mal’s, Evie’s, Carlos’s, and Jay’s parents again, it would have been helpful to feature Uma interacting with her mom and Harry and Gil with their respective dads. As a whole, the plot feels like it would have found its feet if it was forced to be at least forty minutes shorter than its near two-hour running time. Instead, the movie plods until the third act, which finally introduces some much-needed action. Likewise, the tone is a little less fun and lighthearted than the first go around. As stated, Mal spends quite a bit of time being distraught over her place in the world, and while such a conflict would have been fine, it’s dragged out and brings in a dash of angst that was absent in Descendants. 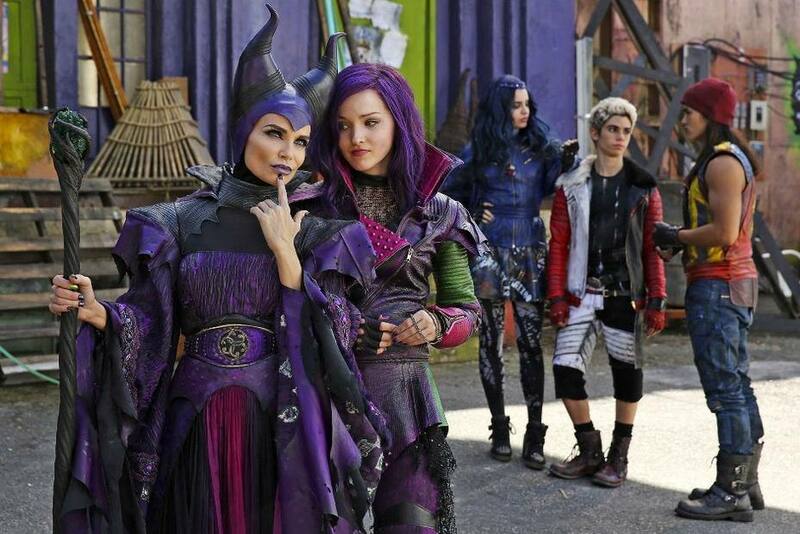 That’s not to say Descendants 2 is depressing as it’s not, but it seems like it’s trying to appeal to an older teen bracket as opposed to the bright, colorful, and more youthfully cheerful Descendants. There were a few other little bones of contention that I didn’t have with the first movie, namely a feminist message involving a very minor character that felt like it was inserted just because and the near-constant reliance upon a “be yourself” mantra. Again, overt messages are fine in media for youth, but to constantly have characters spout lines and sing songs about being yourself started to wear thin and I appreciated the more subtle messages about second chances and good choices from the first film. All of that being said, Descendants 2 does have its bright moments. The lead cast features the characters’ original actors who seamlessly step right into character. Uma, Harry, and Gil are welcomed additions despite being slightly one-note: Gil is a bit of a dunderhead but he’s not so stupid that he’s cringe-worthy, Harry Hook exudes a cocky self-confidence, and Uma is just plain fun as McClain looks like she’s enjoying herself every minute she’s on screen. Not to mention this young lady has some serious vocal power, and her rousing signature musical number, “What’s My Name,” is thrilling to watch and it would be right at home in a Broadway show. Production-wise, Descendants 2 has fancier sets, one of which includes a ship where a climactic sword fight between Mal and Co. and Uma and her crew of scalawags takes place. While the special effects aren’t always up to par, they avoid looking too cheap. Lastly, the soundtrack, while not my favorite between the Descendant movies, still boasts some decent tunes, namely “Ways to Be Wicked” and “What’s My Name.” While the former is more fun to listen to on its own as its incorporation into the movie is a bit forced, the latter is actually more impressive watching it performed by McClain. “Chillin’ Like a Villian” is also a bouncy little pop ditty that’s worth a mention for its bubbly production. And an honorable mention goes to “Space Between,” which is a pretty duet between Dove Cameron and Sofia Carson, but it’s an obligatory ballad that tries to mimic “If Only” in terms of being a serious, self-reflection song. It’s by no means bad and serves its purpose but it’s not the most unique offering on the soundtrack. Lastly, for me, the weakest song is the movie’s closing number, “You and Me,” which sounds like a ripoff of Michael Jackson’s “Man in the Mirror” in terms of theme as it hammers home more vague messages about “being yourself” and “changing the world” and lacks the lighthearted, vibrant energy of Descendant‘s closing tune, “Set it Off“. 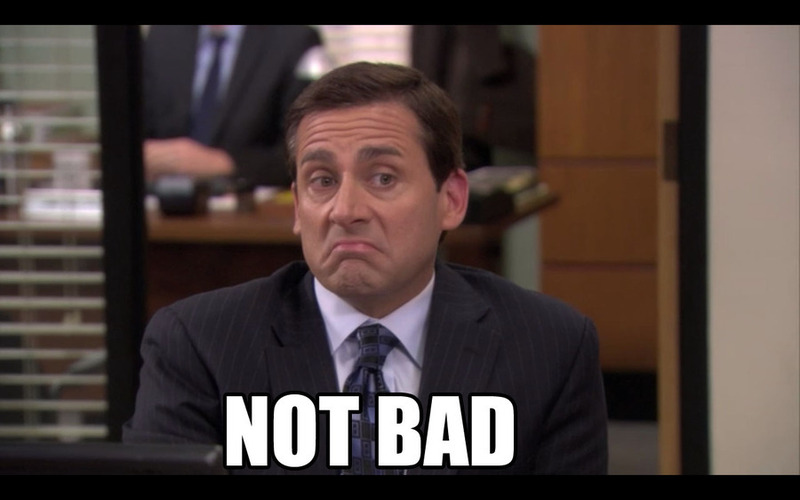 Thus, I’d award Descendants 2 a C letter grade as it’s solidly average. 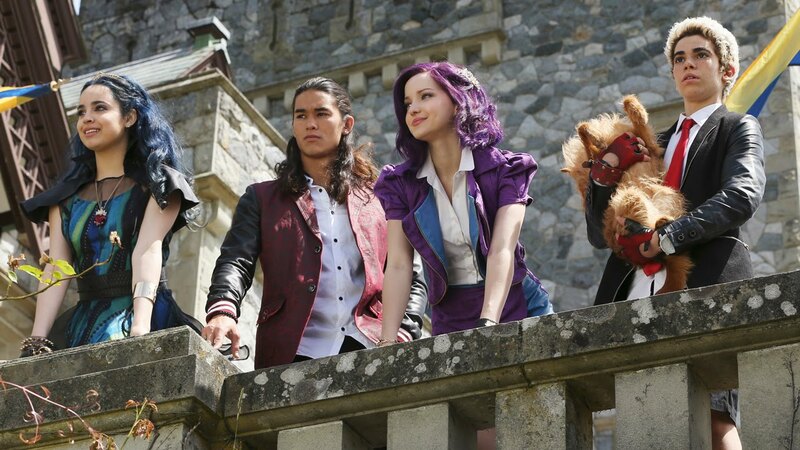 The novelty from Descendants is gone and, in its place, are characters who are not so much intent on having adventures but bemoaning about not fitting in. In the same way, the paper-thin plot meanders, never truly finding its footing, and the music is fairly generic save for the rousing “What’s My Name.” That being said, it has its entertaining moments but I didn’t feel the same sense of cheer that I did with Descendants. Thus, Descendants 2 is less like cotton candy and more like pink lemonade: it’s still colorful and fun with a hint of sweetness but it has some noticeable bitter notes though it’s not unpalatable. As a whole, the Descendants franchise is definitely tailor-made for a teen audience, but that doesn’t mean we adults can’t enjoy the show. I could definitely see teen girls – especially young teen girls – absolutely loving these movies, and that’s great! Content-wise, it’s clean and the messages in general are good and well-intended. Likewise, Disney aficionados of all ages might enjoy checking this out for a creative spin on some classic Disney mythos and figures (though the books of the Descendants series do a stronger job in this regard). Overall, I’d definitely recommend checking out Descendants and, for curiosity’s sake, watch Descendants 2. While this series might inherently hold more appeal for teens, there are enough clever homages, good music, cool characters, and fun adventures all around to satisfy the Disney kid in all of us. Yes, because I’ve seen them and they sound quite good! So I want to give them a read and see if it is a series I could include in my classroom library!